In this unusual episode, Owen takes a break from cohosting and becomes a guest. Owen ran for California Assembly in this election cycle, and Jim interviews him on his experience. Owen goes into the surprises and challenges of being a first-time candidate, and offers advice for anyone considering a similar move. Jim: Hello, and welcome to the Basic Income Podcast. I’m Jim Pugh. This episode is going to be a bit different than our usual episodes. Typically, I’m on here with my co-host Owen, and for this episode, I’m actually going to be interviewing Owen. We haven’t talked about this before, but Owen actually spent most of the past year running for office on a basic income platform. He was running to join the California Assembly to represent District 15, which includes Berkeley and Oakland, and basic income was really core to his platform there. For this episode, I wanted to talk to Owen about his experiences and what implications that might have for other people who are considering running for office on a basic income platform. Owen, welcome. Owen: Thank you. Funny to be welcomed to this podcast. Good to be a guest for once. Jim: Running for office is not a decision to be made lightly. That’s a big commitment, both the campaign and, if you’re elected, actually holding office. Can you just talk us through, what was it that led to your decision to run in this election? Owen: Sure, it was something that I inched toward over a month or two at least, it was something where I’d bring it up kind of semi-seriously in conversations. What really pushed me toward doing it was that I was frustrated that there is so much discussion around basic income, there seems to be a lot of momentum, a lot of excitement, but no politician or very few politicians were stepping up and adding it to their platform or trying to push legislation. Not even the full basic income, but something just kind of taking steps toward that direction. I thought that this idea is too scary for most politicians. No one has to talk about basic income, no one’s going to lose votes because they’re not talking about basic income, and there’s so much more that we can be talking about. Nothing’s really pushing this issue into the political sphere, and so someone has to start doing it. Then my assembly seat opened up, and I thought, well, this isn’t what I was planning to do with my year necessarily, but I can do it. I have the bandwidth and the time to do this. If I’m so frustrated with other people not doing it and I have this somewhat rare opportunity, then okay, maybe I should put my money where my mouth is and step up and see how it goes. Jim: Now, you must have had some expectations coming into this process about what a campaign would look like, what it would mean to actually run for office on this policy. Now that you were in this race and just– I realized we didn’t clarify, you left the race in April. Owen: Right. I didn’t quite make it to the primary. I was on the ballot, got some votes, but yes, I dropped out. Jim: For your thinking when you were getting into the race and your expectations for that, what part of the campaign process matched that and what parts did not? What were the surprises that came along? Owen: Sure. A lot of it is being surprised by what you already knew. I obviously know that politicians spend a lot of time and energy fundraising, but to actually just devote days on end to that, that’s very difficult. It’s a slog. You know going in, okay, I’m going to be doing that, and then you actually do it, it’s very tough. In terms of just organizing, trying to create a movement around yourself, there is something of an inherent ego to politics where you have to– every politician says this isn’t about me, it’s about you, it’s about this whole movement, but at the end of the day, you are trying to get people to check the box next to your name. There is this weird dichotomy there where you’re trying to make it about more than yourself, but at the end of the day, it is about yourself. That was a tricky one to navigate. There were a lot of things that I knew were coming that I still found a bit of a shock. The metaphor I often use in terms of starting to run for office was, I was on a very high diving board and inching towards and inching towards and then you jump. Once you jump, you’re in, there’s no un-jumping, and then the water hits you. You’re like okay, well, now I’m in this new environment. Those are all good questions because this is a very privileged position that I was running for. It’s a huge responsibility, and while anyone can run, it takes a lot to actually do that job well. Jim: Thinking about how people perceive you in a race, we’ve talked about in the past that one of the challenges with basic income is that there’s a lot of folks on the left who actually see the support coming out of Silicon Valley as a negative. That the fact that it is Mark Zuckerberg, Elon Musk, wealthy tech White males, really, that are supporting this idea gives them pause. Because they wonder, are these the people I should be taking my policy cues from? Does the fact that people who have gotten wealthy from the existing system support this mean that there’s something wrong with that? That’s something we’ve talked about before. Obviously, you are not a wealthy tech CEO, but you are a White male who has worked in the tech space broadly. Is that something you were thinking about when you got into this race? Because it’s worth noting that—well, there were a lot of other candidates in the race, but a number of them were women, people of color, and there were other White men in the race, but particularly, that combination with basic income, I’m wondering what you thought about that getting into the election. Owen: Sure. I think that’s a very interesting question broadly, jumping back to the surprises thing, that there were occasionally someone would come up to me and say, you seem like a good person, I like your policies, but there are, to quote one voter, “There are some badass women of color in this race, and why do you think that you should be challenging them?” Anyhow, I’d say, well, no one is bringing attention to this issue the way I am bringing attention to the issue. But that was something I thought a lot about. I also should mention that the reason I dropped out of the race is, I was able to get one of those women of color, Jovanka Beckles, to add basic income to her platform. She just barely squeaked into the top two vote getters, so she will be on the ballot in November for the seat. That was very exciting. Thinking about being a White male at a time when we’re having a reckoning about White men have too much power. Also, yes, there is this kind of dicey part of the movement where it does have a real note of support in Silicon Valley, and some people aren’t sure what to make of that. In terms of how I addressed that, I would say my main tactics were to not focus on automation. I would bring it up occasionally, and people would bring it up. More often, people would bring it up to me, and I’d say yes, there is plenty to talk about there. More I was trying to bring basic income, to show that basic income belongs in a Democratic Party platform. That if you support things like single payer and high minimum wage and worker’s rights and women’s rights, that basic income aligns with all those values and belongs as part of that platform. That’s another reason why– I am a Democrat, but some people ask me if I was running as an independent or a socialist or something like that. I’d say no, I’m a Democrat, and I think this should be part of the Democratic Party. Also, while I was running, we talked to Rocky Fernandez in a previous episode about this, the California Democratic Party adopted basic income in their party platform. It was very cool to see that gradual mainstreaming of the idea at least within California while I was running. Jim: I just want to echo what you just said, that the amount of thought that you put into that before going into the election seemed quite substantial. This wasn’t just a half-thought thing. You actually had thought through how the optics around this, how the outcomes would actually play out. Owen: Yes, and it was important to me to– while I had a very clear emphasis, and I guess it would be fair to call me a single-issue candidate, even though it would annoy me in the media when I would get called that, that it was important that I had a full platform, that I had things to say on healthcare and on schools and on the environment and all that stuff. I mean one, because I care about all those things, and I don’t think just adding a basic income into our current world solves everything, but also to show that this is a candidacy about an entire way of thinking about the world and that includes things like healthcare and schools and the environment. I felt like I needed that one, for my own sake, but also to be a credible candidate because I’m asking voters to choose me as their representative. If all I’ve got is basic income, basic income, basic income, do you want that person representing you? Probably not. Jim: Looking back now that you’ve left the race a couple of months ago, how has this changed your views, both on the political process generally, but also on– has this changed the way that you think about basic income now that you’ve had many conversations with voters and seen how folks out there think about and react to that idea? Has that shifted the way you think about it, your views on what the right approach is, all of that? Owen: I don’t know if it shifted my views so much as it has just given me more of down-on-the-ground look at things. People have a lot of questions, a lot of good questions about how basic income would work. They’re the ones you’d mostly expect around will people quit their jobs, will inflation just make it all meaningless, and some more nonsensical questions. You’ll hear those too. I would say if you are thinking about being a basic income candidate, you need to be ready to answer all those things and more that people are going to throw at you. I would say that one thing I learned is that people are interested in this idea, especially young people. A lot of college Democrats and younger folks in the East Bay area who I became connected to through the campaign, they think this is a great idea. It’s not necessarily what they’re focused on. A lot of them are very concerned with housing for obvious reasons in the Bay Area, but they think that we’re going to need this and that it’s important to their future and our collective future. That was interesting to see. I would also be thanked after pretty much every candidate forum, at least a couple of random people have come up to me and say thanks for bringing this issue into the forefront. I don’t even know if they’re voting for me, but that’s another thing for me is I think this issue is obviously so important that it deserves candidacies, and it deserves lot of attention. Other people think yes, it’s probably a good idea, but it’s not the only thing they’re going to vote on. They want to see the whole package. There are other candidates who maybe don’t think this is a good idea who still have a lot to offer. Also, that people have very limited exposure to basic income. Many people including the incumbent assembly member who’s stepping down, which is why so many people are running in this race, he hadn’t heard of it. I introduced the idea to him. Same with Oakland City Council members, and just a lot of people had either heard of it very vaguely or not heard of it at all and had all the same questions as your man on the street kind of questions. Also, a lot of people had heard of it and were excited and were excited that I was doing what I was doing regardless of whether or not they ultimately supported me. Jim: I think, to what you mentioned earlier, the fact that one of the top two candidates now has basic income on their platform, that’s a big victory in itself even if you did not get elected. Owen: I feel like I came in third even though I didn’t come in third. Jim: If there are other folks out there who are considering running for some sort of office with basic income either as the main part or some part of their platform, what would you say to them? What advice? What notes of caution? What from your experiences could help them related to that path? Owen: For starters, I would say be prepared to be a candidate independent of your support for basic income. Know your local issues, know what all the candidates are going to be asked about. Because again, if– for instance, in my district, there’s a hospital that might close, and it was a big issue that came up again and again. If that’s the big issue in your district, and you have nothing to say about that, all you just want to talk about is basic income, then okay, the people who want their hospital to stay open are not going to vote for you and are not going to see you as a viable representative. Know your local issues. Know your state issues. Know the issues that you have to know to be a candidate whether or not basic income is part of your platform. Also be ready for all the basic income questions, like will this get inflated away, will people quit their jobs, will they drink it away, all these stuff. There’s good evidence and good research on all those questions and plenty more. Be ready for those because people are going to come at you with them. One question I got a lot while I was running, which you should know if you’re thinking about running for something, is are you running to win? I thought that I needed to at least be running to win to have the credibility of a candidate. There were ultimately 12 candidates in my race, nine up to the filing deadline, and the final three didn’t really have much of a shot. Even with nine candidates for most of the race, that’s a lot of candidates, and if you’re giving voters an excuse to ignore you, they probably will. I was running to win with the knowledge that it was a long shot, but I felt like I needed to show that this can be part of the campaign that is running to win. The calculation for you might be a little bit different if you’re thinking about doing this, but it’s something to think about, and it’ll affect how you campaign. I interviewed one potential campaign manager who said, are you willing to change your platform to be more electable? I said, well, when it comes to basic income, no, I’m not. It’s obviously the motivating force here. She said, okay, well, I think this conversation is over. If I just wanted to be an assembly member, then I don’t know if I would have had basic income in my platform, because that might not be the most direct path to doing it. Obviously, I had mixed reasons for doing what I did. I was running to win, but I wasn’t willing to compromise certain things to do that, but it’s something that you have to figure out if you’re doing this. The last thing I would say is consider aiming low if it’s your first run. I ran for Assembly, which was the lower house in California. I was running to represent almost half a million people. It was kind of a crazy thing to do for my first run. Even a city council race can be highly contested and very tough. Part of that was that California is the fifth biggest economy in the world. California could do a basic income. 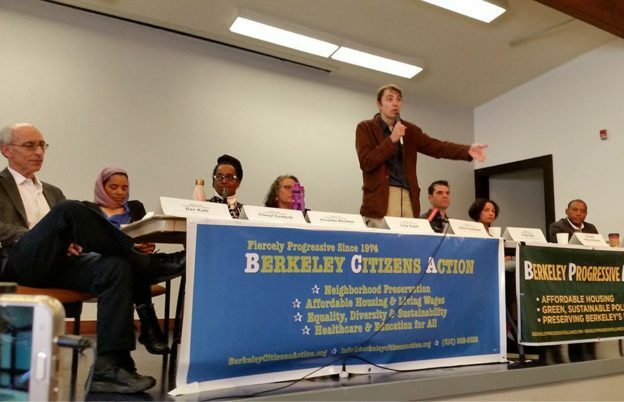 It was kind of in the middle between– I would obviously love a federal basic income, but California is liberal and has the wealth and can talk about something like this in a serious way, whereas the city of Berkeley where I live, it would be hard to imagine anything resembling a basic income there. To not take my own advice, [chuckles] speaking to myself a year ago, I think there’s a lot you can do at the local level, at the city level, even maybe through your school board or your transportation board or whatever it is, there’s a lot you can run for and a lot you can accomplish. In terms of– San Francisco’s talked about like a Baby Bond, where you get like $50 in a savings account when you have a kid and that’s shown to have positive effects. Or maybe it can be a little bit more than that. Maybe you can make certain benefits more universal or more streamlined or have fewer conditions. There are a lot of little things you can do that’s more in the minutia of the kind of things we talk about in basic income as opposed to this giant sweeping policy, which I was there to talk about a giant sweeping policy. In terms of accomplishing things along the way to a basic income or that have a lot of the same values of a basic income and actually getting elected, you have to think about all the different offices you might run for and the pros and cons of each. Jim: I think especially since we see city-level basic income pilots as being something that’s getting more and more attention, any sort of position in a city government where you would have some degree of influence and maybe even could be somewhat informal influence. If you are getting involved in that system and being able to drive it in some way, that gives you some lever of power that you can begin to apply within that system. Owen: Absolutely. I’m just looking at the example of Stockton, California, which is not funding their own basic income, but they are hosting a basic income trial. Had the mayor Michael Tubbs said no, we’re not interested in this, then I don’t think it would be happening in Stockton. Jim: Let’s say, someone, they want to run, they identify an office that they think they have a shot at and allows them to move forward with some sort of contribution around basic income. Is there specific information that you feel like is important for them to make sure they get in advance before deciding to push the button on that? Owen: Specific information, I’m not sure, but I would just start by reaching out to people in your community, people you know, maybe sit down with some city council members or just various groups and leaders in your area and just start to test the waters a little bit. I think that’s something I could have done a bit more. I talked to friends and family about it to see if they thought this was crazy or a good idea. A lot of your friends will probably say yes, go for it. Some will say, are you sure you want to do this? You should listen to those people too. In terms of specific information, I guess I can’t think of anything in particular other than that this is a thing you can do, it’s just it takes a lot. It’s a huge undertaking. There is a political infrastructure in your area. Whether it’s through Indivisible groups, whether it’s through people that have been organizing since the 60s, which is true in my area, there are people who matter and who are movers and shakers whether they’re elected or not. I would just start reaching out to them even if they’re not going to support you right off the bat, just to get to know them and to figure out where the levers are in your area because those are going to matter if you’re going to run for office, and those are the people you’re going to get to know however things go. I got to know a ton of people in local politics, and that’s really exciting. It opens up new ideas and new paths for me to potentially pursue. This is someone who wants to stay involved. Jim: Alright, well, that seems like you’ve given folks a lot to chew on if they’re debating running for office or doing something in that space. Anything else you want to add? Owen: Just that people should feel free to reach out to me. You can find me at @OwenPoindexter on Twitter. There’s other ways to track me down. If you’re thinking about it and want a little push of encouragement or just some thoughts, just feel free to reach out. I’m happy to nudge people toward this crazy undertaking. Jim: Alright. Well, that’ll do it for this somewhat unusual episode of the Basic Income Podcast. Thank you to our producer Erick Davidson. If you like what you hear, please do make sure to rate and review us on Apple Podcasts or the podcast service of your choice. We will talk to you next week. This entry was posted in and tagged ad15, basic income, basic income candidate, basic income podcast, california assembly, podcast, run for office on August 23, 2018 by owenpoindexter@gmail.com.